The first in a slew of restaurants to land at new developments in San Francisco’s Hayes Valley neighborhood opens today. Little Gem, a restaurant from former Thomas Keller Restaurant Group COO Eric Lilavois, and partners John DiFazio and chef Dave Cruz, opens today at the ground floor of 400 Grove, a collection of condos. Little Gem’s counter-service menu will consist mostly of dishes that are free of gluten, dairy and refined sugar, and it will focus on produce, meat and fish that is seasonal. It will also serve wine, beer, smoothies and locally roasted coffee. Lilavois’ team tapped Boor Bridges Architecture — behind such projects as Sightglass and Trou Normand in San Francisco — to design the interior of the 75-seat restaurant. The restaurant is the first to open out of a group of eateries headed to Hayes Valley in group of housing developments from developer DDG and DM Development. 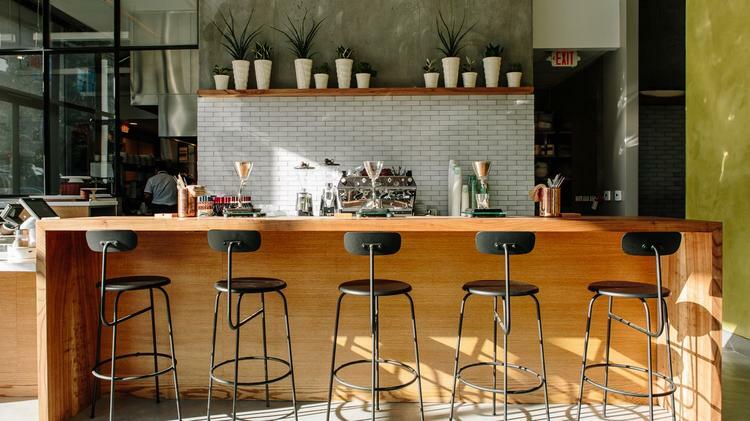 Other projects include True Cup, a sake-centric bar from long-time Hayes Valley retailer True Sake, that will land at 8 Octavia, along with a San Francisco flagship store from popular café mini-chain Boba Guys, which serves boba tea, milk teas and coffee, among other items. Boba Guys owners Andrew Chau and Bin Chen are planning a 1,000-square-foot café at the base of the building, which also houses 47 condos at the corner of Market and Octabia. “I think Hayes Valley was just a perfect play, being in the middle of the city with a really good culture,” Chau said. The café there is significantly bigger than the other stores in Union Square and the Mission District, the largest of which is 700 square-feet. True Cup and Boba Guys will likely open by the end of the first quarter in 2016, followed shortly by a new restaurant from prolific restaurateur Adriano Paganini, who is behind San Francisco restaurants Belga, Beretta, Delarosa, Lolinda, Starbelly, as well as the popular Super Duper burger chain. Joe McMillan, CEO and chairman of DDG, said choosing retail partners for the Hayes Valley developments was a careful process. “We’ve been very selective in choosing the retail partners and considering what they bring to the neighborhood (and) what they provide as an amenity,” McMillan said. He said his team tried to pick either retail partners that were in the neighborhood but needed new space — as in the case of True Sake’s new bar concept — or San Francisco businesses that wanted to enter Hayes Valley, as in the case of Boba Guys and Adriano Paganini’s restaurant. Bringing in new retail can be tricky in Hayes Valley, which has a ban on “formula retail” chains that have more than 11 other retail locations worldwide. Hayes Valley neighborhood businesses recently lost a battle over the opening of chain clothing retailer Kit & Ace, which found a loophole in the neighborhood ordinance by getting approvals before it had expanded, despite heavy opposition from the smaller retailers in the area. McMillan pointed out that his team was careful to avoid formula retail businesses and choose local businesses that would be an asset to the area. It’s all part of the Market-Octavia Neighborhood Plan, an effort to create a residential and commercial hub.